Louisa completed her Bachelor of Visual Arts from Auckland University of Technology in 2012. Louisa exhibits frequently as well as writes and co-hosts the website #500words and also has writing published online on Circuit. Louisa explores social trends among diasporic communities through time based media. The use of pop culture and humour, means her documentary style provides a real peephole into what it means to be a part of these hybrid cultures. Louisa’s films are reactionary to both her immediate surroundings and community, the work changes with the changes to her surroundings. This pattern of working makes her films great archives for moments in time. The main quality of her work is honesty. That honesty allows her to transcend communities and tell stories in a way that is easy for an audience to interact with. Twenty Three Years captures the artist’s mother talking openly and honestly about her experience with a Housing New Zealand Corporation worker. Louisa having spent her entire life of 23 years at this state house, takes us on a tour of the property, where we hear the audio of her mother. Darcell Apelu completed her Master of Art and Design from Auckland University of Technology in 2013 and more recently completing a diploma of teaching in 2014. Darcell exhibits frequently while also currently teaching within the certificate of art and design and the bachelor of creative industries at the Bay of Plenty Polytechnic. Darcell’s art practice involves mediums such as moving image, sound, performance and installation. Her practice is informed by her experiences as an afakasi female. 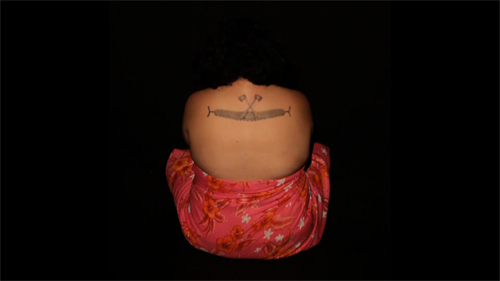 The body plays an important role as she explores perceptions of the Pacific body, identity and of ‘being other’ within the social climate of New Zealand. She explores the duality of the pacific community with a populace-autobiographical perspective within the western masculine framework. Gavin Hipkins is an Auckland-based artist who works with photography and moving image. His projects engage film as a cinematic art that blurs definable genres between drama, documentary, film essay, and experimental narrative structures. In 2014, Hipkins’ first feature film Erewhon — an essay adaptation of Samuel Butler’s 1872 novel Erewhon, Or Over the Range — premiered at the New Zealand International Film Festival and Edinburgh Art Festival. He has exhibited widely. Recent exhibitions and screenings include: International Film Festival Rotterdam, The Netherlands (2015); The Jewish Museum, New York, USA (2015); Museum of Arts and Design (MAD), New York, USA (2014); Internationale Kurzfilmtage Oberhausen, Germany (2013); Armory Film, The Armory Show, New York (2012); Centre Pompidou, Paris, France (2011); Austrian Museum of Applied Art and Contemporary Art (MAK), Vienna, Austria (2011). He is an Associate Professor of Fine Arts at Elam School of Fine Arts, The University of Auckland. Date: 2013 | Formats: 11:30 HD video | Artist: Gavin Hipkins | Music: Torben Tilly | Sound Editor: Chris Todd | Sound Design and Dialogue Editor: Ben Sinclair | First exhibited at The Physics Room, 2013. With additional support from Elam School of Fine Arts, The University of Auckland. Australian born, Wulgurukaba country, Rebecca Ann Hobbs is a contemporary visual arts practitioner and currently academic staff at the Manukau Institute of Technology in Otara, Tāmaki Makaurau. Working with multimedia to create video and still images that mostly celebrate dynamic bodies and their relationships with specific sites. Hobbs has been invited to participate in international exhibitions in Australia, France, Germany, New Zealand, Poland, Scotland, Sweden, Turkey and the U.S.A. In 2002 Hobbs received the Australian Samstag International Visual Arts Scholarship, allowing her to undertake tertiary education at the California Institute of the Arts, where she completed a Masters in Fine Arts in 2005. Measuring a 246 meter bridge with whines, pops and rolls. 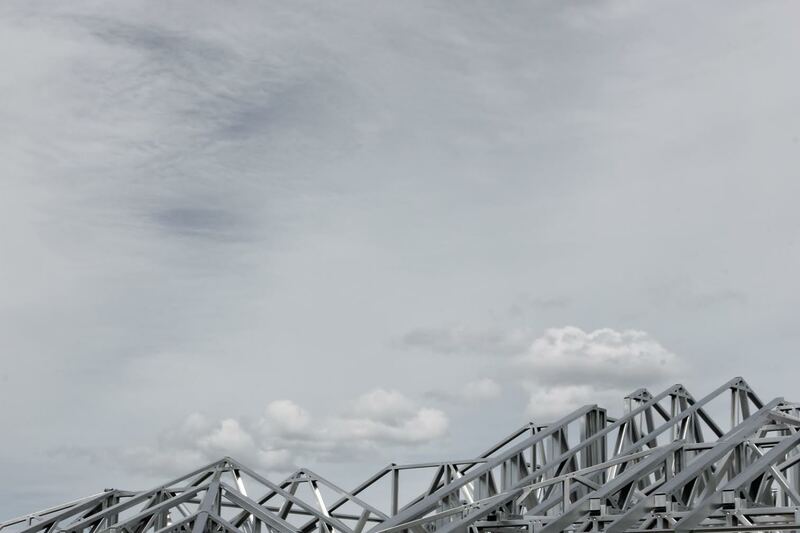 246 Meter Bridge is part of a series of video works shot in South Auckland spaces, influenced by dance. Dancehall refers to a genre of music that originates from Jamaica, but it is also a term that indicates an entire culture in which music, dance, fashion and community collide. For example the more flamboyant and dexterous a dancehall queen’s performance the more she is able to represent her hood at a “Sound Clash” event. Social and political change is the platform from which dancehall culture evolved; a change in politics from Manley’s PNP to Seaga’s JLP created shifts in the local economic structure of Jamaica. This movement allowed people to start advancing out of the confines of their previously prescribed socioeconomic status. Again the aforementioned dancehall queen can maintain her own beauty business during the week and perform at the “Sound Clash” on the weekend, dressed in the full dancehall regalia that her small business finances. 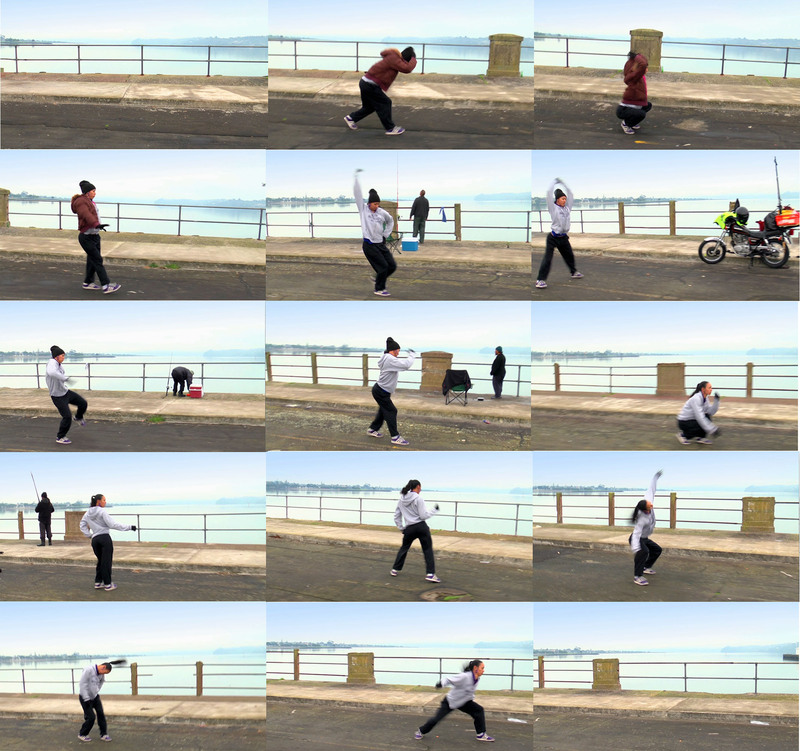 In this moving image work we track a dancer as she progresses the length of the Old Mangere Bridge, a structure that joins the North (Onehunga) with the South (Mangere Bridge). The bridge no longer functions as a thoroughfare, instead different communities come together to fish, play and hang. This video work is intended as a celebration of dancehall and the reinterpretation of culture through site. Sound clash – a musical competition where crew members from opposing dancehall sound systems pit their skills against each other. Occupying the Fair Mall stage, in Otara, late at night. Otara at Night is part of a series of video works shot in South Auckland spaces, influenced by dance. Dancehall refers to a genre of music that originates from Jamaica, but it is also a term that indicates an entire culture in which music, dance, fashion and community collide. For example the more flamboyant and dexterous a dancehall queen’s performance the more she is able to represent her hood at a “Sound Clash” event. Social and political change is the platform from which dancehall culture evolved; a change in politics from Manley’s PNP to Seaga’s JLP created shifts in the local economic structure of Jamaica. This movement allowed people to start advancing out of the confines of their previously prescribed socioeconomic status. Again the aforementioned dancehall queen can maintain her own beauty business during the week and perform at the “Sound Clash” on the weekend, dressed in the full dancehall regalia that her small business finances. In this moving image work we watch a South Auckland queen take Otara as her stage to perform her nocturnal dance. This video work is intended as a celebration of dancehall and the reinterpretation of culture through site. Five cameras, six dancers and lots of movement. 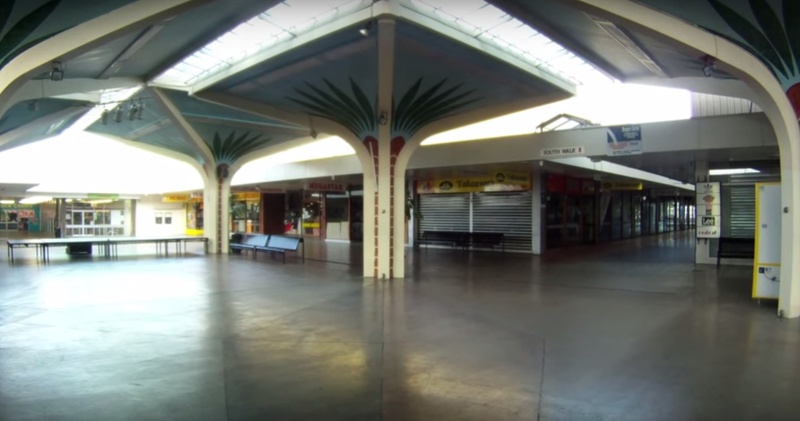 Mangere Mall is part of a series of video works shot in South Auckland spaces, influenced by dance. Voguing is a style of modern house dance that originates from the Harlem ballroom scene of the 1980’s. Inspired by heteronormative high fashion and popular culture of the type to be found in glossy magazines like Vogue. The dance genre is characterized by angular, linear, rigid poses, which are choreographed into dynamic walks that can contain more than the occasional dip or drop. The contemporary Voguing style has migrated to Aotearoa, with the Waikato based VOGUE Dance Crew incorporating moves that have been influenced by the syncopated movements of Voguing. In this moving image work we see the dancers performing under the canopies of the Mangere Town Centre. Which is located near an industrial centre and was one of a number of town centre developments instigated by the 1970’s New Zealand government, as part of a state housing program. During the late 1970’s and 80’s the ethnic status of the area changed greatly, with an influx of Pacific Islanders, who took up work in the surrounding industrial areas. The Mangere Town Centre was originally an open-air mall, before the fresh local community designed the canopy structures to accommodate their use of the space. This video work is intended as a celebration of the movement and reinterpretation of culture. Sonya Lacey’s practice is driven by ideas around the physical form of public communications within spoken, printed and online scenarios. She works across a number of media, including performance, video and installation, often drawing on historical narratives to emphasise the experiential potential of this material. Her work is included in the 2015 London International Film Festival, and she recently exhibited at the Centre for Contemporary Art, Singapore. She has shown extensively through New Zealand public institutions. Sonya currently lives and works in Wellington, New Zealand. Sonya Lacey and Sarah Rose make up the collaborative project lightreading. lightreading have attended residencies and exhibited work in Korea, Canada, Glasgow and New Zealand. As well as her studio practice, Lacey is also interested in curatorial, publishing and collaborative methodologies. By Sea begins with a script – a fictional narrative based around a set of seaside apartments. The apartments are built in the form of the words Par Mer (French for By Sea). The letters are monumental; a two storey apartment complex that can be read from above. There are two main threads in the story. The first is that the buildings are subject to erosion by salt spray from the ocean, which wears down the letter forms causing the architecture to become illegible, and the occupants come to doubt the language that they occupy. The second idea is to imagine what it might mean to embody or occupy language – and how words on paper might be experienced differently to spoken language, for example. Production of the work involved gathering salt water from the local beaches, evaporating the water and harvesting the salt. This salt was then used to cast the walls of a model, inside which most of the filming takes place. Other footage was captured using a digital microscope. Ngahuia Harrison is an Auckland, NZ based artist. Currently in Doctorate study at Auckland University of Technolody. Ngatiwai and Nga Puhi descent her research concerns are indigenous histories, methodologies and exploring these concerns within a creative practice. Bridget Reweti’s (Ngāti Ranginui, Ngāi Te Rangi) is from Tauranga Moana. Her work explores the representation of New Zealand’s iconic landscapes by employing traditional photographic techniques to subvert the scenic view. Reweti’s critique on landscape perspectives is informed by customary knowledge of Māori names and narratives. She seeks to show the land as known and inhabited through portraying the shifting set of roles between observer and participant. Currently based in Wellington, Bridget has recently completed a Masters in Māori Visual Arts through Massey University. She also has a collaborative practice with Mata Aho Collective. 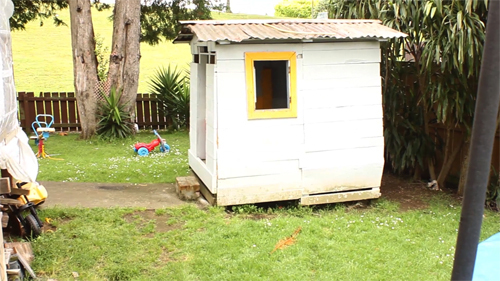 These moving image works are part of a four video series that are set in Tauranga Moana and Te Tai Poutini (The West Coast). The series references the narrative of Tamaahua and his chase across country from Tuhua (Mayor Island) to the Arahura River in search for his wife Waitaiki and her captor Poutini. This narrative is from my ancestral homeland, Tauranga and portrays a map of important geological deposits throughout Aotearoa New Zealand. Each moving image work was filmed at a significant site from the narrative. Each work is a two-channel synchronised moving image with sound. The left channel shows the construction or deconstruction of my own hand-made camera obscura tent. The camera obscura tent addresses modes of representation through the undefined roles of participant and observer. The right channel shows the inverted view of the landscape from within the camera obcura tent. Reminiscent of late 1800s surveyors tents, the camera obscura tent simulates the three-legged taipō, a surveying tool Māori referred to as a goblin. Exploring colonial histories, customary Māori narratives, and contemporary use of land these works seek to show the complexity current landscape perspectives within Aoteaora New Zealand. The twee titles are in reference to the slightly comic acts, which occur at random throughout all the videos. The exposed nature of the films aids the conceptual reading of the works by questioning the true nature of ‘the scene’. Terri Te Tau is a trans-disciplinary artist of Rangitāne and Ngāti Kahungunu descent and grew up in the Wairarapa region of New Zealand. She is working towards a Doctorate in Fine Arts at Te Pūtahi a Toi, Massey University and is a current recipient of the Sasakawa Young Leaders Fellowship Fund (SYLFF) scholarship. Terri completed a Bachelor of Māori Visual Arts at Massey in 2008 followed by a Post-Graduate Diploma in Māori Visual Arts. In 2009 she moved to Paris where she was granted a summer residency at Parsons Paris School of Art and Design. She is a member of the Mata Aho Collective and also performs in an on-going collaborative music project The Live Jukebox. She has participated in group shows within public galleries and project spaces in Aotearoa New Zealand, Denmark and New York. Unwarranted and Unregistered #2 (2013) is a video adaption of a multimedia installation. 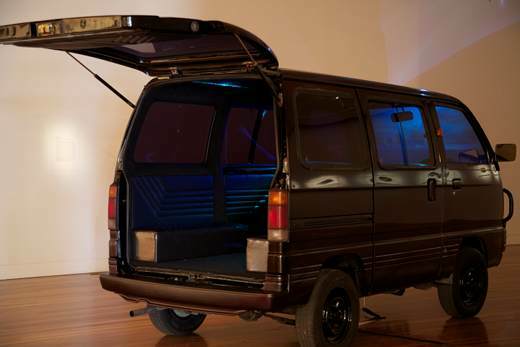 The installation features a high gloss cherry black van and projection sited within a gallery space. Visitors are invited to enter the dark interior and watch as the van journeys along the main road of Greytown in the Wairarapa. The driverless vehicle tracks and marks out the small town as HUDs (heads up displays) appear on the front windscreen, registering and logging the passing cars, scanning the layout of buildings and identifying people on the street. As the journey progresses data onscreen increases until the sight of the landscape is lost altogether. The film is accompanied by Jose Carreras’ operatic and orchestral rendition of E Hine E. E Hine E is a classic Māori waiata that was utilised by mainstream TV channels in the 1980’s/90’s to signal the end of transmission for the night (known as the Goodnight Kiwi). Image: Installation Shot – Unwarranted and Unregistered in the Mata Aho collective exhibition Pūwawau at Aratoi: Wairarapa Museum of Art and History, 2013. Graduating with a Bachelor of Visual Arts from Auckland University of Technology in 2009, John Vea returned in 2013 to complete Postgraduate study. John has been included in a number of performances and exhibitions across New Zealand. Based in Auckland, John predominately works with sculpture, moving image and performance exploring the results of Pacific migration and gentrification of New Zealand. Finish this week off and that’s it! The re-made work titled ‘Finish this week off and that’s it!’ is made up of five life size projections filmed a week apart of myself holding a large rock for as long as I can (25min) before disappearing out of view, then each of the projected footage loops and instead of five of me returning back to view only 4 return while one projected screen still has the rock still positioned on the ground. This process continues every 25 minutes, one image/recording of me disappearing sequentially until only one is lifting the rock on his own. For the duration of the filming I ate below the poverty line ($2.25 per week), tracking the changes of my body and strength. By highlighting the physical impact of eating on this budget, this work reminds us that those who are limited to this budget often have physically demanding jobs. Also one figure disappearing in every loop of the projected screens possibly emphasizes the aspect of redundancy.